Air conditioners do not make cold. They move heat from one place to another. So they don't produce anything, the just pump it around. If you have ever passed close to a window air conditioner on the outside, you may have noticed the heat coming from the condenser. 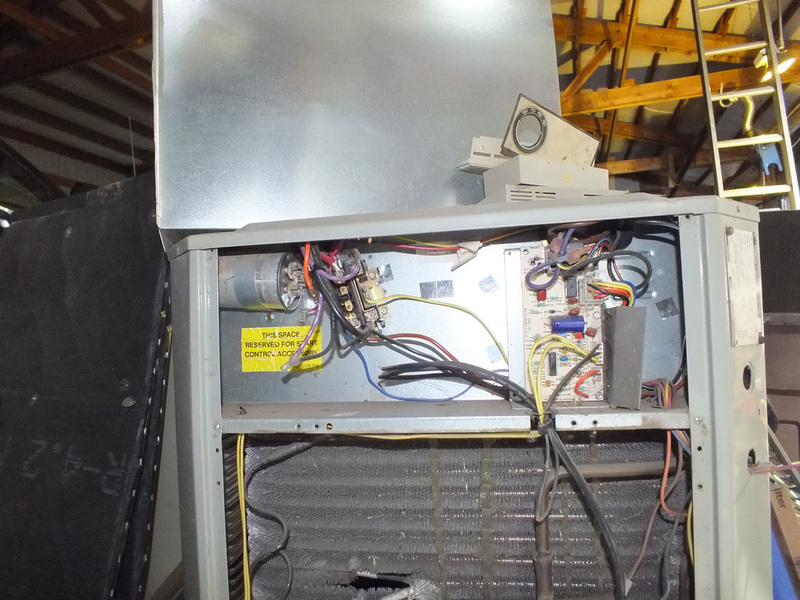 This heat is the heat that was absorbed by the evaporator on the inside and is now being rejected to the outside. So what if I reversed the air conditioner in the window. Could I heat the inside with heat absorbed from the outside. But if it is cold outside, can I bring in heat from the cold air outside? The answer to that is yes. Unless the outside temperature is very low, there will be heat that can be effectively absorbed in the outside air. Thus we use a heat pump to move that heat from the outside to the inside. Early heat pumps were simply air conditioners with a special valve that could reverse the refrigerant flow. Heat pumps have been around since the 1930s but were more of a curiosity than an effective heating system. The advantage to heat pumps is that by using the compression refrigeration system, you could move more energy than it takes to run the system. The amount of heat moved is dependent on the temperature difference between inside and outside. If, for example the temperature difference is 20F, the pump could move up to 400% of what it uses to operate. However, if the temperature difference is 50F it may only move 150%. With the energy shortages of the 1970s, heat pumps became one of the "solutions" to the energy crises. When properly installed and sized, they could reduce electricity usage by approximately 1/2 in the northern climates when electric heat is the alternative. The video below takes a look at the air source heat pump. The heat pump is a refrigeration system that, when it shuts down, the refrigerant moves to different places in the system. As an example, the colder the outdoor temp, the more the refrigerant moves to the outdoor unit. Once the unit starts, the refrigerant must get into a balance in order for the unit to operate efficiently. This takes time. During this time, the unit is not moving heat as efficienctly as it should. So, how long does this take? It depends on the outdoor temperature. The lower the temperature, the longer it takes. The video below gives an idea how this works. The heat source for the heat pump is the outside air. By lowering the temperature of the outdoor air, BTUs are absorbed. The amount of BTUs absorbed is dependent on the outdoor temperature and the amount the temperature is reduced across the coil. The video below demonstrates how this works. As the outdoor temperature reduces when compared to indoor temperature, the compression ratio of the compressor increases. When this happens, the compressor is effectively smaller in capacity. As a comparison, If the unit is 36000BTUs with a 20F degree temperature difference between high side and low side, if I increase the temperature difference to 40F, the compressor pumps less gas so its capacity reduces to say 28000BTUs. The video below shows the difference in temperature rise in the indoor unit when the pump is running at higher temperatures compared to lower temperatures.